The Jackson Presidential Dollar was designed by Joel Iskowitz and executed by Jim Licaretz. United State Mint image. The Andrew Jackson Presidential Dollar honors one of the best-known American presidents. Jackson was the seventh president, serving two terms from 1829 to 1837. His presidency was a very controversial one in its time. Jackson took on the most powerful men in America, both in politics and business, and almost always came out on top through sheer force of will when deal-making and political bargaining wasn't enough. Jackson was also a quick-tempered, hot-blooded man who fought 13 duels during his lifetime to defend his own and his wife's honor. This article tells about some of the highlights of the man behind the Jackson Presidential Dollar. Andrew Jackson was born in the South Carolina back-country on March 15, 1767. His childhood was very hard; his mother was widowed three weeks before Jackson's birth, and he would lose his entire family by the age of 14. Jackson joined a local regiment at 13, serving as a courier in the Revolutionary War, only to be captured by the British. His mother and both older brothers died of hardships suffered during the American Revolution. Andrew Jackson's early education was spotty and poor, but through hard work and diligence he learned enough to become a schoolteacher. By the time he was 20, he had passed the bar and began practicing law on the frontier, where lawyers were few and a good education wasn't necessarily a requirement. Hard work, guts, and a clever mind earned Jackson various frontier government appointments, culminating with his first foray into politics as a delegate to the Tennessee constitutional convention in 1796. Andrew Jackson was elected to the U.S. House of Representatives as Tennessee's first congressman in 1796, and then to the U.S. Senate in 1797, where he resigned within a year to take a seat on the Tennessee Supreme Court. (26 years later, he would be elected to the Senate again, only to resign again before half the term was up!) For most poorly-educated frontier lawyers, a seat on a State Supreme Court would be the culmination of a spectacular career, but Andrew Jackson was just getting started! By 1797, at the age of 30, Jackson was a seasoned real estate speculator, owned 15 slaves, and had built some of the area's first general stores. He prospered in this business initially, but barely averted bankruptcy when a deal went bad, only to recover to the point that he purchased his plantation and permanent home, the Hermitage, in 1804. Through additional land acquisitions, the Hermitage plantation would eventually reach 1,000 acres and hold up to 150 slaves. As Jackson's star continued to rise, he became Commander of the Tennessee Militia in 1801. When the War of 1812 broke out, Andrew Jackson distinguished himself for bravery and leadership, earning a nickname that would stick with him the rest of his life: "Old Hickory." Soldiers under his command, with whom Jackson was popular, claimed that he was "tough as old hickory wood." Jackson spent the next 10 years as a military leader, gaining numerous high-profile victories against the British, Spanish, and American Indians. He became a nationally-known war hero by 1821. Andrew Jackson was nominated for U.S. President by the Tennessee legislature in 1822. In the 1824 Presidential election, Jackson ran in a 4-way race against John Quincy Adams, Henry Clay, and William Crawford, earning both the highest electoral vote count and the most popular votes. However, since no candidate won a majority of the electoral votes, the election was decided by the House of Representatives, which chose Adams in what Jackson called the corrupt bargain. Jackson finally prevailed in the election of 1828, winning election as President of the United States by a wide margin, but his moment of greatest triumph was also to be his moment of greatest tragedy. Andrew Jackson met the love of his life in 1788, at the age of 21. Her name was Rachel Donelson Robards, and she was the wife of another man. Trapped in an unhappy and abusive marriage, Rachel finally obtained a separation from her husband, Captain Lewis Robards, in 1790. Shortly thereafter, the Captain sent word that he had completed the necessary legal paperwork to divorce Rachel, and she was free to remarry. In a mistake that Jackson was sure to regret the rest of life, the aspiring lawyer failed to verify the legal records, and married Rachel in 1791. Two years later, the happy couple learned that the Captain had deceived them, and Rachel's divorce had never been completed! Jackson undertook to set the matter aright, and they remarried legally in 1794, but for the rest of his life, Jackson's detractors would use this purported bigamy against him to slur his and Rachel's names. Andrew and Rachel never had any children of their own, but they legally adopted two children and served as guardians for eight more! Rachel was a quiet, religious woman, not given to the fashionable and social activities her husband thrived on. She preferred evenings at home with her family, and had plenty of them as Andrew traveled extensively during their marriage. Although they seem to be opposites in most ways, these opposites enjoyed a powerful attraction, and they were deeply devoted to each other throughout their lives. Andrew Jackson was elected President of the United States in December of 1828, during a heated campaign that saw he and his wife's virtue attacked continuously, with their ill-fated first marriage as the target. Rachel didn't handle this public pressure well, and she became ill and depressed. Even as her husband gained his greatest victory in life by being elected to the White House, Rachel became weaker. She died on December 22, 1828, and was buried on Christmas Eve. Andrew Jackson's wife of 37 years would never become his First Lady. 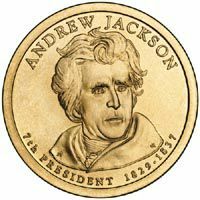 The Andrew Jackson Presidential Dollar honors the seventh President of the United States, who served from 1829 to 1837. In Part One of this article, we learned about Jackson's early life and pre-presidential career, and how he lost the love of his life on the eve of his greatest triumph. In Part Two, we'll examine Andrew Jackson's presidency, one of the greatest of them all. Andrew Jackson's presidency was very controversial in its day. Jackson took on some divisive issues with courage and determination, doing what he thought was best for the popular good. He had been elected on a platform of frontier democracy, the idea that happiness and success was there for taking; all a man had to do was work hard and seek his fortune. Jackson's handlers portrayed him as "Everyman," the self-made son of poor immigrants who had risen through hard work and persistence. At Jackson's inaugural party, he threw open the doors of the White House and let the common people in. The result was a drunken, destructive mob that very nearly got completely out of hand, but the common people loved Jackson for making this gesture. During Jackson's presidency, he dealt with several major issues which are summarized below. The Second Bank of the United States - President Jackson was vehemently opposed to the Second Bank, whose federal charter was due to expire in 1836. Jackson felt that the Bank didn't serve the needs of the average American, that its policies and practices favored the rich and elite. He didn't think it was good for the nation to have all of its monetary assets concentrated in one institution, plus Jackson discovered that the Bank engaged in fraudulent practices. The Bank's president, Nicholas Biddle, challenged President Jackson head-on, applying for an early renewal of the Bank's charter in 1832. Although the charter renewal bill passed in congress, Jackson vetoed it. He withdrew the government's funds in 1833 and distributed them widely among other banks. The Second Bank's charter expired in 1836, but by then the Bank was well on its way to bankruptcy. The Specie Circular - Once the Second Bank's hegemony was broken, local and state banks sprang up everywhere, issuing paper currency that had no precious metal backing. The resulting inflation forced President Jackson to issue the Specie Circular in 1836, which was a demand that all sales of government land be paid for in specie (gold and silver coins.) Demand for specie quickly increased, but banks which had issued banknotes without gold and silver backing didn't have the funds to make good on their notes, and therefore collapsed. The large number of failing banks was a primary cause of the Panic of 1837, a deep economic depression that lasted for years. The Indian Removal Act - Andrew Jackson had a long history of cruel suppression of the Native American tribes he encountered during his military campaigns. Although he legally adopted and raised a young Creek boy who was orphaned, Jackson was a heartless advocate of the "Indian Removal" practices which were formalized into law by the Indian Removal Act of 1830. Indian Removal was the practice of forcing Native American nations to sell their land to the government in exchange for lands farther west. The military then "escorted" the nations to their new home by force. The Cherokee Trail of Tears is the best-known of these horrendous actions. The Nullification Crisis - South Carolina was opposed to certain high tariffs being imposed on European imports. It passed legislation that nullified the federal tariffs, in effect attempting to assert that a state had the right to overturn federal laws it disapproved of. President Jackson fought back, asserting that as a Union, no state had the right to overturn federal laws or to secede from the Union, and that the Union had the right to use force to ensure a state's compliance. Fortunately, a compromise was reached, averting military intervention. One of the side effects of Jackson's three presidential campaigns was the formation of the Democratic Party. Although presidential campaigns were conducted very differently in Jackson's day, (for instance, the candidate never made any campaign appearances,) the party Jackson represented was the working man's party. Jackson's detractors called him a "jackass" during the 1828 presidential campaign, an appellation that the contrarian Jackson warmed to. He even adopted the jackass as a campaign symbol, and it eventually became the Democratic Party's central icon. Following his second term in office, Jackson returned to the Hermitage. He kept up an active correspondence and remained influential in politics, keeping abreast of events by subscribing to more than 20 newspapers! Jackson was a major player in establishing congressional support for the annexation of Texas, and advised 11th president James Polk during his successful bid for the White House. Few would argue that President Andrew Jackson led a remarkable life. He overcame the adversity of being born poor to a newly-widowed mother, only to become an orphan himself at 14. Jackson faced near bankruptcy twice during his life, and lost his beloved wife, Rachel, on the eve of his greatest moment. He fought more than a dozen duels because his hot temper got the best of him, and he carried an assortment of bullets and slugs in his body throughout his life from these encounters. Jackson was often in pain from these wounds, sometimes coughing up blood and suffering vicious headaches and abdominal distress. Through all these challenges, Andrew Jackson gritted his teeth and fought onward and upward, becoming one of America's most influential presidents. Today, President Andrew Jackson is best-known to the average American because his portrait appears on the $20 bill. Jackson would find this ironic, since he detested paper money, especially that which had no precious metal backing it up (like ours.) I wonder if Jackson would have approved of his Presidential Dollar.